We all know that exercise is an important part of keeping your dog healthy and engaged. But there are times when your dog might find it hard to keep up with you on walks or runs. When this happens, they might need a little help. Dog strollers are ideal for dogs that are injured, ill, or just suffering the effects of old age. A stroller allows them to get out and about with you and to enjoy the sights and sounds of the outdoors, while also being able to rest when they need to. 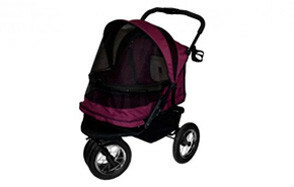 If you need a dog pram, then it is important to buy one that is suitable for your pet pooch. However, with so many different ones on the market, it can be difficult to know where to start. Our panel of pet experts and dog lovers have compiled a list of the 10 best dog strollers to make your search just that bit easier. The Paws & Pals 3 Wheeler Elite Jogger Pet Stroller is ideal for smaller or senior dogs who cannot manage longer walks. It is also ideal for pets who do not like rain or need to go out during adverse weather conditions. The stroller features front and rear zips, making loading and unloading your pet easy. It also features a leash clip to secure your pet and ensure they cannot escape or tumble out when the canopy is up. The stroller is easy to set up and folds easily with the press of a button. Its compact size when folded makes it simple to store and ideal for traveling. The three wheeled Pet Gear No-Zip NV Pet Stroller comes complete with a wet weather cover and bolster pad, so you know that your pet is safe and comfortable whenever you take them out in their stroller. The no-zip system makes it easy to load and unload your pet quickly and with the minimum of fuss. The three-position canopy provides a panoramic view of your dog’s surroundings, while the Air Ride tires provide a more comfortable ride, even over uneven or rough terrain. The stroller is ideal for slightly larger pets with a weight limit of 70lb and is easy to fold for storage and traveling. If you are looking for a stroller that offers extra storage room, then the All Terrain Extra Wide 3 Wheels Pet Stroller by BestPet might be just what you are looking for. The easy to fold stroller comes with lots of undercarriage space and cup holders in the handle to keep you and your pet pooch hydrated on your walks. The stroller also offers front and rear entry and mesh window ventilation at the front and rear, as well as at the top of the canopy, reducing the risk of your pet overheating on hot days. The nylon exterior is tough and water resistant and the stroller comes complete with a rain cover for very wet days. The HPZ Pet Rover Premium Heavy Duty Pet Stroller is ideal for larger or heavier dogs. The four-wheeler stroller comes complete with 360-degree rotating front wheels and a rear braking system to give you complete directional control while out on your walks. The comfort ride wheels and anti-vibration system ensure that your pet pooch has the most comfortable ride possible, while the heavy-duty, lightweight frame means you can travel over most terrain types with ease. The stroller compartment is weatherproof and includes a high-density, UV-reflective, and odorless breathable mesh cover. The two pads in the compartment further improve your dog’s comfort and are made from machine-washable and stain-resistant, high-density Oxford 1600D polyester. The VIVO Four Wheel Pet Stroller has a large compartment that easily fits multiple smaller dogs. The protective compartment has zipper access points to make it easier for pets to enter and exit the compartment. It also features a removable screen and mesh windows for your pets to have the best view in good weather. The whole canopy can also be opened to let fresh air in on warm days. The stroller folds easily for storage and travel. It also offers good undercarriage storage and a cup holder to keep you and your pets hydrated. If you are looking for a stroller that can be easily hitched to your bicycle, then the 2-in-1 Pet Stroller and Trailer by Best Choice Products might be just what you are looking for. The three-wheel stroller has a sturdy, lightweight steel frame and a water-resistant polyester cover that protects your pet pooch from rain and sun. The cover includes a 2-in-1 bug screen, which is ideal for keeping bugs out when the stroller is attached in trailer mode. It also features a comfortable removable cushion, so you know that your dog is traveling in comfort and style, whatever the terrain. When used as a trailer it can be kept in place with a built-in hand-lock brake system, while the reflectors and safety flag ensure that it is easily visible to other road users, even in low light conditions. The Pet Gear NO-Zip Expedition Stroller features a push button, zipperless entry system that is ideal for getting your pets in and out of the stroller quickly, particularly in bad weather. The dual entry system means that pets can be loaded from the front or rear of the stroller, making it easier for injured or older pets. 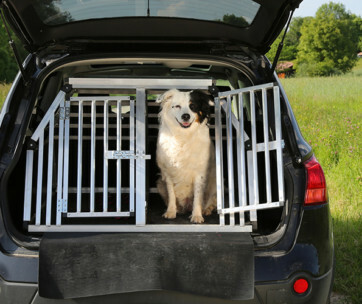 The spacious compartment provides plenty of room for multiple smaller dogs or a single larger dog. The stroller features a multi-position handle so you can adjust the height to suit your needs and comfort. The VIVO Three Wheel Pet Stroller offers a large protective space for your pet to ride in style. 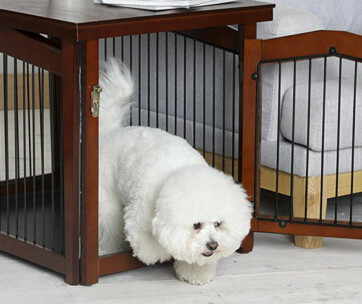 The compartment has a zipper access point to keep your pet secure and mesh windows, so your pet has access to good ventilation and a view of the outside as you walk. The stroller features undercarriage storage, dual cup holder, and a center tray, so you have everything you need with you for your walk and space for extras. The stroller is easily collapsible and compact for easy storage and transportation. If you are looking for a truly multipurpose pet carrier, then the Multifunction Pet Carrier by ibiyaya might be just what you are looking for. The carrier converts from a stroller to a backpack, carrier on wheels, and a car seat. It is ideal for small pets in every traveling situation. The stroller frame is made from plastic and light metal and includes high-quality, wear-resistant wheels. The three-wheel design is ideal for rougher terrain and directional control is helped by the 360-dress rotating front wheel. It is easy to switch between the carrier’s different functions and the protective shell features a mesh window and smoother zipper fasteners. The pet carrier comes complete with the folding cart, multistage telescopic handle, and machine washable padding. The backpack straps are also padded and are adjustable for a comfortable fit. If you need to transport multiple pets at the same time, then the Pet Gear NO-Zip Double Pet Stroller could be the answer that you are looking for. The extra-wide interior easily fits two small dogs and comes complete with two safety tethers. The no-zip design makes it quick and easy for your dogs to enter and exit the stroller, while the bolster pads and large Air Ride tires ensure a comfortable journey over any terrain. The three-wheel design includes a 360-degree rotating front wheel for additional directional control. The rear foot brake is quick-locking and gives you additional peace of mind. The stroller is suitable for use in all weather conditions and uses 600 Denier water-resistant material for the pet cabin. It also includes a weather cover for additional coverage in heavy rain. Buying pet stroller can help give a sick, old, or injured dog a new lease of life. A puppy stroller can also be a useful tool for socializing young dogs before they are able to be put down on the ground or walk long distances. But it is important to buy an appropriate dog carriage that suits the size, breed, and needs of your dog. To help with this, in this part of the buying guide we explore the key considerations for buying a dog stroller and discuss why you should use a stroller designed for pets. We also outline the different types of strollers and answer some of the most frequently asked questions about pet strollers. Socialization, fresh air, and a change of scenery are important for all dogs, even those whose mobility may be limited for whatever reason. While very small dogs can be carried by their owners there is always a risk of injury to the owner or injury to the dog should the owner fall. For larger dogs, carrying is out of the question. A dog stroller is the perfect answer. When looking for the perfect stroller there are a few key points that you should consider. All dog strollers will have a recommended maximum carrying weight. It is important that you do not exceed this as it may make the stroller unstable and potentially cause it to fail. The actual size of the carrying compartment is just as important. Your dog needs to be able to sit and lay down comfortably. Consider the height of the compartment as well as its length and width. A good way to test whether it is suitable for your dog is to lay a towel down at home and get your dog to lay on it in their usual position. Take measurements of the area of the towel that they need to be comfortable and compare this to the dimensions of the compartment on the stroller you are considering. If you need to transport more than one dog, then you will need to consider the weight and size needs of both dogs. As well as being larger strollers that are designed for multiple dogs should have multiple leash attachment points or other safety features and more room for their toys and other accessories. All dog strollers are designed to be sturdy and provide a comfortable ride on flat, even ground. However, some are specifically designed to deal with rougher terrain and uneven surfaces. If you are considering hiking or walking through woods or generally going off the beaten track, then look for a stroller that is designed for such terrain. The type of terrain you are planning on walking over will also affect the number and type of wheels that you need to look for on a stroller. Generally, three-wheel strollers with air-filled tires are considered to be the better choice for hiking and jogging. Solid wheel and four-wheel designs are ideal for flat surfaces and general walking around towns and parks. An effective and easy to use braking system is a must to help you avoid accidents and run-away strollers. Some strollers have front and rear brakes, others just rear braking systems. Check the position of the brake control and ensure that it is in easy reach while you are pushing the stroller. The best dog strollers come complete with safety restraints or leash clips. This gives you peace of mind knowing that your dog cannot fall or jump out while you are walking. It also reduces the amount of movement in the stroller, which helps maintain weight distribution and balance. Most strollers come complete with hoods or canopies that completely close to keep your dog secure and protected in less pleasant weather conditions. Some stroller canopies close with zips, while others use a no-zip system and instead use clip locks or something similar. It really depends on which you find easiest to deal with when securing your pet in the stroller. Just remember that you may only have one hand free to open and close the canopy. If you have an older or injured pet, then a stroller with front and rear entrances can be useful as it reduces the need for your dog to turn around or try to exit the stroller backward. Make sure that your pet can reach to get into the stroller, particularly if it is a larger dog that is too heavy to lift. The best strollers have compartments that are covered with hardwearing and durable, weather-proof materials. They should also be easy to clean and resistant to mold growth. If the stroller is not weather-proof, then look for one that comes complete with a weather cover. There are numerous reasons why it is useful to invest in a dog stroller. Firstly, for very young puppies that are not ready to be on the ground outside the house, a puppy stroller enables you to start the process of socialization without the risk of them picking up germs. When they are old enough to go down on the ground, having a stroller means you can continue your walk once they are tired. It also means you can limit their walking time so that you reduce the risk of damage to their growing joints, muscles, and ligaments. If you have smaller dogs, even those in full health may struggle to walk long distances. Little legs get tired, so dog strollers for small dogs allow you to take longer walks without wearing out your pet pooch. If you have two small dogs with different energy levels, then a double pet stroller enables you to more easily cater to the needs of both dogs. Sick or injured pets who are in the process of recovery still need access to fresh air and a change of surroundings. They may not have the energy to walk or may need to keep dressings clean, so being down on the ground is not always feasible. A dog buggy is the perfect answer, especially one with a closed compartment that keeps your pet out of the elements but still allows them to enjoy their surroundings. 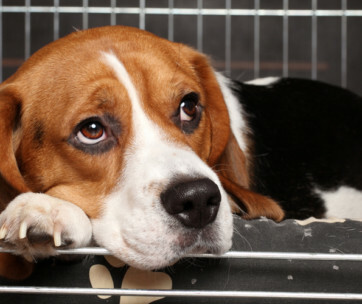 As dogs age, they often become less active and larger dogs especially can suffer from a range of joint issues. This can make walking distances very difficult and they can be too tired and in too much pain to play once you reach the dog park. Investing in a large dog stroller allows you to get your dog to their favorite destination, gives them the energy to play and socialize, and gives you the peace of mind that you can get them home safely and without causing pain or injury. 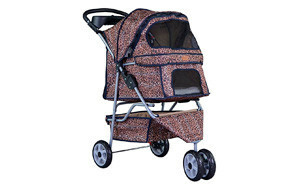 Most pet strollers follow the same basic design. They are comprised of a compartment, usually with a closing hood or canopy, which sits on a frame with wheels at the bottom and a handle at the top. Within this basic design, you have strollers that are designed for specific purposes such as carrying multiple pets, larger or heavier dogs, jogging and hiking, and lightweight strollers designed for easy folding for traveling. Other differences in design relate to the number of wheels, the type of wheels (solid or air-filled), and the type of braking system. There are also some strollers that have multiple purposes such as those that can be attached to a bicycle as a trailer and those that can be transformed into carrying cases, backpacks, and car seats. Q: What size dog stroller does my dog need? A: When choosing the right size stroller for your dog it is important to weigh your dog. All strollers have a maximum recommended carrying weight and going over this weight can affect the stability and integrity of the stroller. Remember if you are adding items to the undercarriage storage, this will add to the overall weight being carried by the stroller. Another measure you need to consider is the dimensions of the carrying compartment. Your dog needs to be comfortable sitting and laying down. The best way to ensure this is to measure the area your dog takes up in their normal laying position. To do this, take a towel and fold it to the dimensions of the stroller that you are considering. Get your dog to lay on that surface and see whether they fit comfortably. If there is space around your dog, then the stroller will be a good fit. If your dog is hanging off the towel, then it is likely the stroller will be too small. 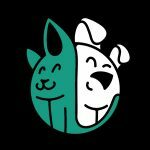 Q: How can I get my pet to use their dog stroller? A: Leave the stroller set up in the house and let your dog explore it. Praise them when they go near or investigate it so that they understand that it is for them. Leave treats and toys in the carrying compartment and praise them if they get into it. If they need to be lifted or helped in them remember to praise and encourage as you do this. Do not force them to stay in there and work up to using the leash clips or restraints so your dog is comfortable with the space first. As with any new item you are introducing to your dog time and patience are the keys to success. Q: What type of wheels are best for a dog stroller? A: The most common types of wheels found on dog strollers are plastic, rubber, and AirRide. Plastic/EVA wheels are ideal for flat paved paths. They are lightweight, durable, and easy to push. However, they do not provide great traction. Rubber wheels are more traditional and provide better traction. For strollers that are going to be attached to bicycles or used over longer distances, they are much better. However, it is important to check your air pressure regularly and carry a puncture repair kit, just in case. Air Ride tires are larger than traditional rubber wheels and are more suited to rougher terrain. If you are planning on hiking, going off-road, or jogging with your stroller, then these will provide the best stability and comfort for your pet. 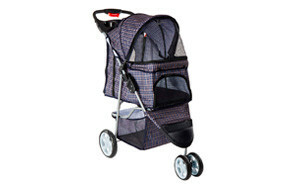 Our top pick is the Paws & Pals 3 Wheeler Elite Jogger Pet Stroller. It is ideal for smaller or senior dogs who cannot manage longer walks. It is also ideal for pets who do not like rain or need to go out during adverse weather conditions. The stroller features front and rear zips, making loading and unloading your pet easy. It also features a leash clip to secure your pet and ensure they cannot escape or tumble out when the canopy is up. The stroller is easy to set up and folds easily with the press of a button. Its compact size when folded makes it simple to store and ideal for traveling.